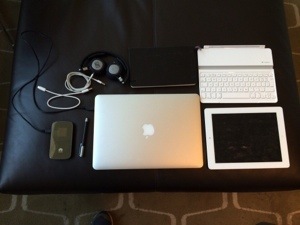 Since I’ve been working remotely I’ve tried lots of different hardware tools and have settled on the following. 13″ MacBook Air (mid 2013) 8GB RAM, 500 GB SDD – I bought this because it’s light and has a big HDD and a long battery life, although any light and powerful computer will do. The MBA is used primarily to get real work done.. when I’m reviewing and drafting things I use the iPad. Notepad – for a when a computer just isn’t needed. Sennheiser MM 400 headphones – Great for keeping the noise out when working on the road, plus has a built in microphone which makes moving from music/podcasts to Skype really easy. iPhone 5s (not pictured). Keeps me intouch and can be used as Hotspot when my broadband dongle is out of juice. This entry was posted in Uncategorized and tagged remote working. Bookmark the permalink.